Mother’s Day is just around the corner. Have you thought about what you can give your Mother this year? Perhaps your are considering flowers, chocolates, or a card, but why not give her something more meaningful? 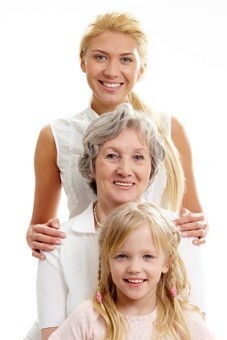 When you think of family history, the first thing that comes to my mind is family, of course. Part of the beauty of heritage scrapbooking is to do it for our posterity, or to share the things we have learned about our own family with others. Giving your Mother a gift of a scrapbook, or layout that is all about her family could be a wonderful gift to give. First, try making an album that is all about your Grandmother. Give it to your Mother for Mother’s Day. This will be a priceless gift. You can fill it with mementos she has saved, and pictures of her and her Mother together. I know that my Mom has saved lots of notes, and poems that my grandmother has written to her in cards and letters over the years. Putting that together in a beautiful way will be something that she will cherish forever. Another idea is to create an album full of photos of yourself and your Mother together. You can fill it with thoughts and feelings about how grateful you are to have her as a mother. Include pictures of you and your mother together when you were a child as well as photos of the two of you together as adults. Another idea is to create a shadow box for your Mother. You could fill it with some of her favorite things. You could also include things in it that you have grown to love because of her. Include a note in the shadow box expressing how grateful you are to her for all that she has done for you. My last idea is for grandmothers. Create a heritage album all about your grandmother and give it to her as a gift. Express in the journaling how grateful you are to her for being such a good mother to your Mom and a wonderful grandmother to you. Include pictures of her as a young mother, as well as pictures of her with you. This will be something that she will love to look at over and over again. Whatever you decide to give, make it something personal this year. I can guarantee your Mother will treasure it always.